As a writer it is my desire to write something new every time I sit down to write yet many times I find myself repeating myself or reusing a familiar scripture. For example Paul’s quote from Galatians above is one I’ve used and not only that but you’re probably very familiar with it yourself. This morning I find myself wondering what value is there when I use a familiar scripture or I repeat myself. One of the things I have discovered over the years as powerful as they are words written, spoken, or read are insufficient in themselves, their main purpose is to open us up to a life changing experience. It is not enough just to know God. It is not enough just to read and gain knowledge about God’s Promise and his promises. It is not enough just to read, “…the Spirit produces the fruit of love, joy, peace, patience, kindness, goodness, faithfulness, gentleness, self-control,” they are to bring to life the qualities of God they represent in us. God and his world are to be experienced. 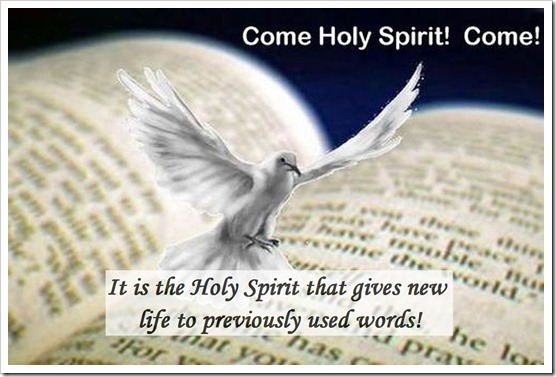 It is the Holy Spirit that gives new life to previously used words! Words come to life not between the pages of a book, on a computer screen, or in our ears, they come to life in our hearts and not by human means but through divine design. Don’t just read, “Remember your promise to me, your servant; it gives me hope. When I suffer, this comforts me: Your promise gives me life.” (Psalm 119:49–50, NCV) Take them into your heart and experience the Holy Spirit bringing them to life not on your computer screen but in the minutes and hours of today.